This was absolutely brilliant!! Only due to my taste and the punch of the parmesan and garlic, I added a cup of mushroom soup and it just upped the mushroom kick! An absolute winner, thank you so much for sharing! I always use crimini mushrooms. White ones have very little flavor. Thank you so much for posting this recipe, I have scored major points with my wife for making it. It has become our favorite chicken recipe and for a cooking husband it goes together easily. Making it again tonight for guests. Excellent! Not a fan of mushrooms so we did not use. We used 6 chicken breasts and doubled the sauce recipe so we would have extra to serve over bow tie pasta. It was really, really good!! Will definitely make again! Thank you so much for posting your recipes have not tried them yet but will soon. I thank everyone for there comment. Soooo good! Thank you ?? omg i made this last night……..and it was sooooooo yummy! THANK YOU for sharing it!!! I freaking love this recipe! I have made it probably 5 times now. I modify it slightly by using coconut flour or xanthan gum in order to keep it keto. I’ll serve it with broccoli for me and a baked potato for hubby. Thank you!! This recipe was so good. I’d rather eat this creamy pasta than go out to fancy Italian any day! I did make one edit by adding 1 extra tablespoon on flour just to make it a bit thicker. I love this recipe! It’s my go-to when I have spinach I need to get rid of. I also like that I can sub in other veggies if we don’t have mushrooms- like carrots or snow peas. I like to serve it over right or potatoes and it’s amazing! I’ve loved it all three times I’ve made it and I’ve always made it different. 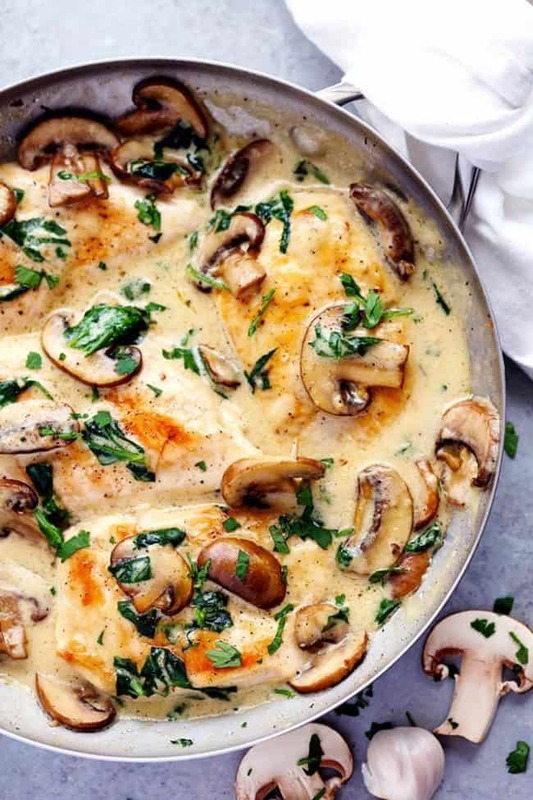 I do add double the garlic, however, because I love a strong garlic flavor in the sauce but it’s flavorful enough on its own. An easy weekday dinner that even my toddler loved! I served this with gnocchi and it flattened out some of the saltiness. Great recipe! 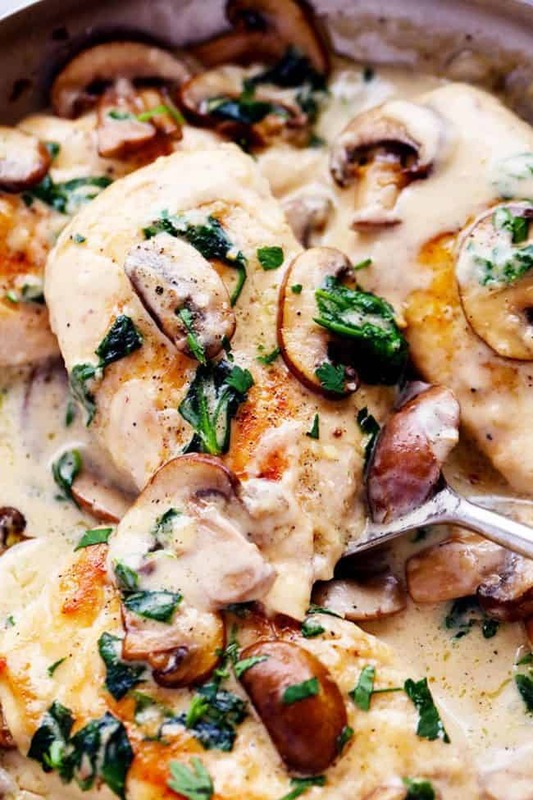 The Creamy Parmesan Garlic Mushroom Chicken looks delicious. What side dishes do you serve with it? Can this dish be made ahead and frozen.? What else can I use if I don’t have the creamy Parmesan garlic sauce ?? Can I leave it out and it’ll taste good anyway?? The creamy parmesan sauce is made with the ingredients underneath the listing. Hope that helps! This is my go to white sauce from now on! Just the right flavor. Not too salty. I tried this same recipe with broccoli. Just delicious! This is DELICIOUS!! We made it tonight and the only thing we changed was doubling the amount of mushrooms that the recipe calls for. (I had 2 packages and I wanted to use them up.) Easy peasy and it came together quickly. The sauce was a little thick, so I added a dash of milk to loosen it up rather than additional half & half. This is a winner-winner chicken dinner! I want to add that I RARELY review a recipe. And often I tweak recipes or meld 2 or 3 different recipes together. I’m a terrible baker but a pretty good cook. This recipe is THAT GOOD! I HAD to come and say “thank you” to the woman who created it. No tweaking necessary! This was delicious ! I slice the chicken breast in about a half inch strips before cooking. I also used 4 cloves of garlic instead of 2 because we love garlic. Served this over pasta and it was a huge hit. Thanks for sharing this recipe. The creaminess of this was perfect – I have been trying to find a recipe without flour, but this is so creamy and not at all floury. My son really liked it. Question: Did you use regular white button mushrooms? Because I have never been able to get my button mushrooms brown like that. Or is it another kind? Yes, regular white button mushrooms. Easy, fast, nutritious, and delicious! What more can I ask for? I had to quadruple the batch because this recipe would have only fed ,1-1/2 people. We like to eat. I needed my husband’s help because my back & leg hurt really bad from so much standing and sitting but the end result was very good. It was worth the agony that it took for me to make it! What’s better to use half and half or heavy cream? I’m making this tomorrow. My husband doesn’t like boneless chicken, so tonight we are going to try this using bone in chicken thighs!!! Hope it works! Salt the chicken on both sides before you brown it. It tasted very bland. Rest was delicious. Pretty good recipe, I did not have any parmesan cheese so I substituted “Blue Cheese Crumbles” and added caramelized onions, and topped with crisp crumbled bacon. I served it over steamed broccoli to ease the carbs. Very good, was a big hit with my boyfriend, he can’t stop saying how great it was, definitely make again and again! This recipe is fantastic. The second time I made it I also added a diced red onion and sliced sun dried tomatoes. The sauce was so delicious , I wish I would’ve doubled the quantity of liquid. Also, I subbed spinach for garlic, parsley, bay leaf and red pepper flakes. Turned out really nice. Thanks for tje recipe. It was very good. I did not have half and half or cream. I substituted with evoparated milk. It turn off pretty creamy. can I use almond flour? or is it still keto friendly with just the tablespoon of regular flour? My husband and I loved this recipe. Definitely a keeper!! Thank you for sharing this recipe. My husband and I absolutely loved it. My husband likes alot of sauce so I doubled the sauce portion . I see making quite a lot in my house. This is so great we plan to make the sauce and use with pasta as well. My only change next time will be to add additional spinach. For those cooking challenged like myself this is very easy to make and very hard to mess up! This is an absolute favorite in our house! The sauce…..oh my gosh it is honestly the best. I have started making the sauce to top beef and venison, and WOW!!!!! It is better than dessert! 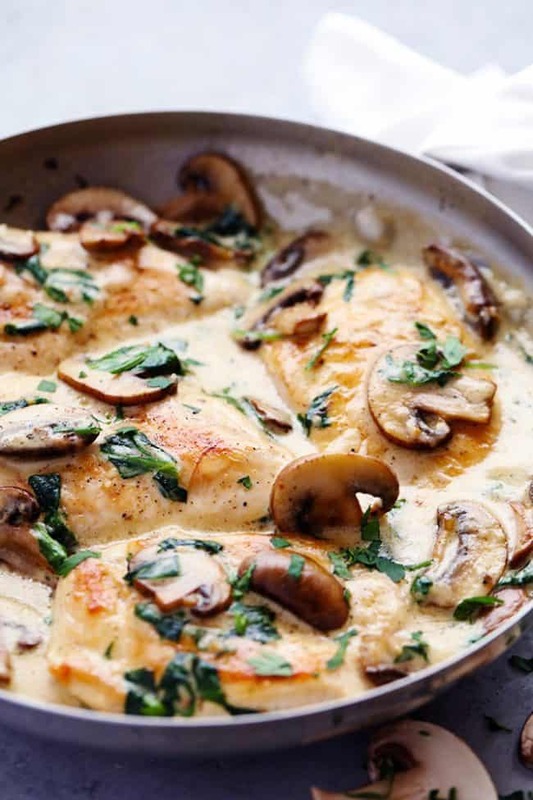 Would it work if I cooked the chicken in broth in the crockpot, then cook mushrooms /make sauce/transfer to the skillet (follow the recipe from step 2) later, when I get home?? Or will that ruin the flavor? Shouldn’t the butter read 1/4 stick and not 1/4 cup? My husbands all time favorite meal was from this Italian restaurant in town that now closed. I started the search to recreate it. I stumbled upon your recipe and made it tonight and had to come and post this was it!! I’m thrilled I was able to recreate his favorite dish!! I just subbed out mushrooms for broccoli and added pasta for the kids. Such a huge hit and it’s now been requested to be made every week! Thank you so much for this delicious dish!! I just made this for our New Years Eve get together. It was a huge hit! I will definitely be trying some of your other recipes. LOVE IT!! Have made it several times. I just made this recipe tonight and DH and I absolutely loved it! 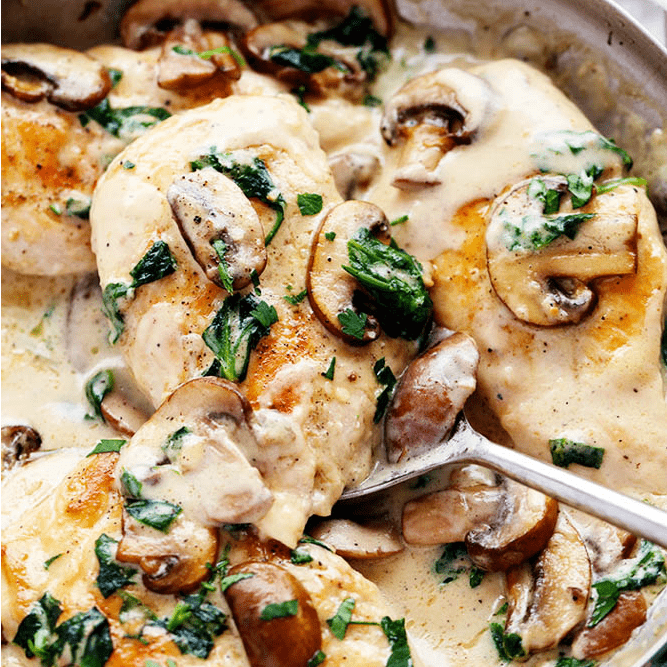 We’re having company next week and I’m planning to make Creamy Garlic Parmesan Mushroom Chicken. I have one question; when I read the recipe I sliced the chicken breasts across the grain. I watched your video just now and it looks like the chicken breasts length wise instead? Any tips on how you accomplished that with slippery chicken? It certainly looks prettier the way the video shows the chicken in larger slices than my smaller slices. Thank you for sharing! yummy it was so good. I will make this again.